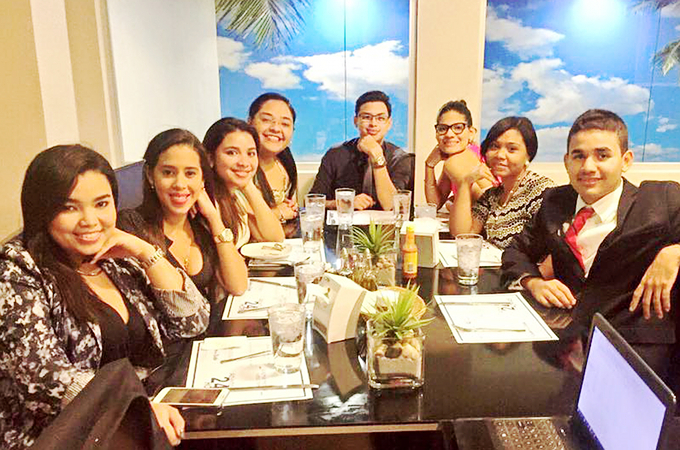 The second-year University of Panama law students who organized the event. Photo by Mayella Lloyd. On November 20 and 21 at the headquarters of Panama’s Colegio Nacional de Abogados the Sixth International Constitutional Power Congress was held, with the theme of “A way to confront the world crisis” and the participation of noteworthy national and international panelists. The event was convened by the Panamanian Academy of Administrative Law, the Panamanian Constitutional Law Association, the Lawyers College of Panama, the Institute for Political and International Studies, the Constituent Process of Catalonia and the Chilean Students and Citizens Network for a Democratic Constitutionalism. The responsibility for organizing this activity fell upon, it should be pointed out, the first semester second year students of the University of Panama’s law and political science department, who with a great deal of commitment and responsibility perfected a successful event. Within the framework of the congress a deserved tribute was rendered to the Panamanian constitutionalist Carlos Bolívar Pedreschi, an enthusiastic exponent of constitutional rule, of a constituent assembly and of the Panamanian nation. Once the president of the Colegio de Abogados opened the event, Rigoberto González Montenegro began with an exposition about constitutional breakdown and its implications. Among the national panelists: Adán Arnulfo Arjona, who expounded on what should not be left out in a constitutional change; and Salvador Sánchez, who laid out the subject of constituent power and democracy. Carmen Luz Urriola spoke about constituent power from another perspective and Carlos Vasquez spoke about legal professionals and a constituent assembly. Among the international speakers present Patricio Pazmiño Freire, the former president of Ecuador’s Constitutional Court, spoke about constitutional reform and recall processes and transformations of regimes. Manuel Monsonís and Matías Sagredo talked about the experiences of campaigns for constituent assemblies in Chile and Barcelona. By video Teresa Forçades, Leonidas Vatikiotis and Roberto Viciano spoke about important constitutional subjects from Barcelona, Cyprus and Valencia respectively. Previous congresses have been held in Mexico, Ecuador, Caracas, Cadiz and Barcelona.